The calculator of signals operates directly from the MetaTrader 5 terminal, which is a serious advantage, since the terminal provides a preliminary selection and sorts out signals. This way, users can see in the terminal only the signals that ensure a maximum compatibility with their trading accounts. The calculator of signals gives the answer to the one of the questions most frequently asked by users of the Signals service: "Will I be able to subscribe to the signal NNN, and what volume of the position will be copied to my trading account?" More details on the operation and mechanisms of the utility can be found in the article of the same name Calculator of signals. Attention! The panel of the utility has a size of 980*456 - make the chart window as large as possible before using the utility. Trading account's balance — balance of a trading account that is connected at the moment — editable field. After attaching the calculator of signals to a chart or changing a timeframe of a chart, the "Balance" field contains a balance of a trading account that is connected at the moment. This field allows only numbers from 0 to 9. Trading account's currency — currency of a trading account that is connected at the moment — a drop down list of the most common currencies. After attaching the calculator of signals to a chart or changing a time frame of a chart, the calculator attempts to find a currency name of a trading account connected at the moment in the list. If there is no correspondence, then "USD" is selected as a default currency. Плечо торгового счёта — leverage of a trading account that is connected at the moment — a drop down list of the most common leverages. After attaching the calculator of signals to a chart or changing a time frame of a chart, the calculator attempts to find a leverage of a trading account connected at the moment in the list. If there is no correspondence, then "1:100" is selected as a default leverage. Deposit load when copying a signal — a drop down list from the terminal menu "Tools" - "Options" - "Signals". After attaching the calculator to a chart or changing a time frame of a chart, the calculator attempts to find a deposit load of a trading account connected at the moment in the list. If there is no correspondence, then "95%" will be selected as a default load. The "Growth, %" column — percentage of increase due to trading operations. The "Signal" column — name of a trading signal. The "Funds" column — amount of own funds in a provider's account considering liabilities. The "Currency" column — currency of a signal provider's trading account. 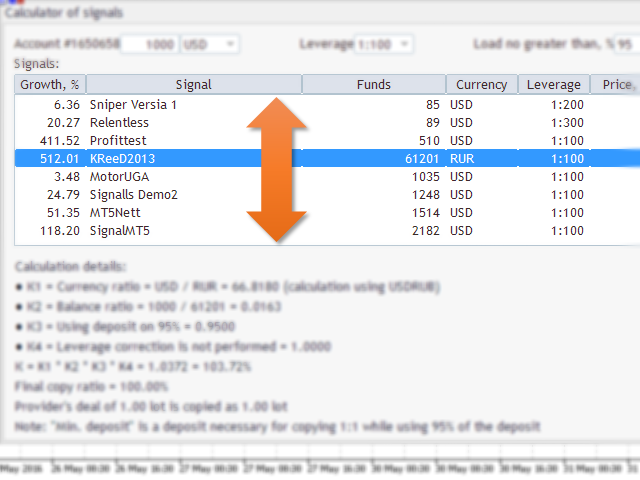 The "Leverage" column — leverage of a signal provider's trading account. The "Price, $" column — price of a trading signal, in $. The "Copy ratio" column — copy ratio calculated for every signal with selected settings: "Trading account's balance", "Trading account's currency", "Trading account's leverage" and "Deposit load when copying a signal". The "Min. deposit *" column — deposit required for copying 1:1 when using a deposit for 95%. To clarify, this is a deposit where signal provider's trades are copied to you trading account in proportion 1:1, on condition that a load on a "95%" deposit is selected. Detailed calculation of copy ratio — step by step calculation of a selected signal's copy ratio. К1 — ratio of currencies of your trading account and signal provider's trading account. К2 — ratio of balances of your trading account and signal provider's trading account. К3 — ratio of using a deposit. Converting percentage to ratio. К4 — correction ratio on a leverage difference. К — final ratio. It is calculated as a ratio product К1*К2*К3*К4. Final copy ratio — the К ratio rounded using a multistep algorithm. Increased the number of rows in the table. Now it is more convenient to scroll the table. Improved the calculation speed. Displays the percentage of the processed signals while in progress.